I’ll be traveling to Gettysburg this weekend to lead another Staff Ride and as I listened to President Trump’s remarks about the Civil War and on altering the American Constitution to fit his needs for his success this week that I was incredulous. I cannot believe that we have a President who is such an ignoramus about history and the Constitution. damned before Sadly, despite all the blood shed and the sacrifices made by slaves, free Blacks, abolitionists, Union Soldiers, civil rights advocates and others it seems that the President and his supporters are fully intent on rolling back Constitutional protections for many people in this country. In fact the President this week declared that the Constitution and our system of government were “archaic,” and suggested that they needed to be changed. Many of his supporters who for decades have claimed to be defending the Constitution seem to have no problem with with what he says, showing that their words are mere hyperbole and cover to prevent others from enjoying the same liberties that they have; be they African Americans, Hispanics, LGBTQ, Women, Native Americans, Muslims, and immigrants deemed less than worthy. 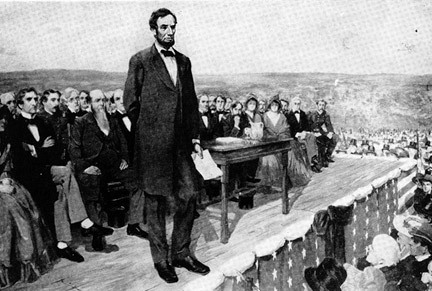 So I will go to Gettysburg this weekend and as always I will take my students to the Soldier’s Cemetery where we will talk about the Gettysburg Address and the meaning of it and our Constitution, at a place where Lincoln said that we “highly resolve that these dead shall not have died in vain — that this nation, under God, shall have a new birth of freedom — and that government of the people, by the people, for the people, shall not perish from the earth.